“Think outside the box.” I really, really dislike that saying. To me, there are few phrases more “inside the box” than “think outside the box.” It reminds me of those Inspirational Quote posters you see plastered on the walls throughout middle schools. 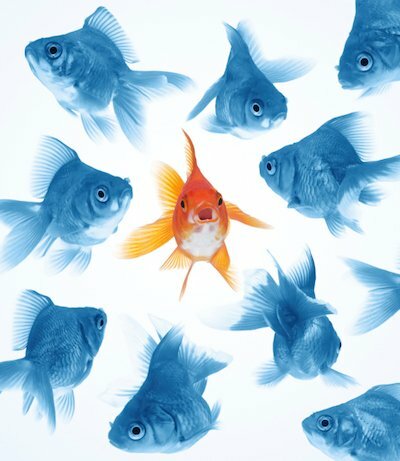 The ones that say things like “Be different” and show one golden fish in a sea of indistinguishable blue fish. Sure, the saying was inventive at one time. But we’ve used it so often it’s exhausted, stale and uninspiring. Know what else it reminds me of? The eBook. There was a time when crafting an eBook was thinking outside of the box. A well-researched, well-written and informative piece of content your audience actually wants to download? How could it fail? It couldn’t, and it didn’t. But once one marketer realized the lead-generating power of the eBook, we all did. So we cranked out in-depth eBooks like there was no tomorrow, and our extraordinary, shimmering eBook…slowly…turned…blue. Think about it: When was the last time you downloaded an eBook? And if you have downloaded an eBook recently, did you actually read it cover to cover? If you’re anything like me, the answer is no. Content marketing is always evolving, and as the eBook fades into the crowd, a new wave of creative and worthwhile content must emerge to capture attention, nurture interest and drive decision. Here, I share a few favorite creative content offers our team has stumbled upon in recent months. An easy way to ensure your infographic isn’t lost in the shuffle is to pair it with another content marketing offering: the video. Check out this video and infographic by Vidyard to get a better idea of how well these two pieces of content can complement one another. It shouldn’t come as a surprise that interactive webpages are a hefty undertaking. In addition to your usual creative content suspects of writers, designers and videographers, you’ll need a heck of a web development team to bring your vision to life. If you don’t have the team (or the budget) it takes to tackle a project like an interactive webpage, know your content offers don’t have to be flashy to delight. Sometimes the best offers are those that simply make your audience’s lives easier. Marketers, for example, are often pressed for time. And because we’re pressed for time, we’re on the constant lookout for resources and tools to help us get our jobs done faster and more efficiently. To address this pain point, HubSpot created 151 browser bookmarks every marketer should install. The offer was merely an HTML file that contained bookmarks to helpful marketing tools and resources and step-by-step instructions for installing the bookmarks on a handful of popular browsers. The bookmarks didn’t engage me like a more advanced interactive piece of content could, but they certainly got me excited enough to download the bookmarks and share the landing page on my social channels. Before I close this blog, I’d be foolish not to mention that while the average eBook probably won’t have the same success it would have had just two years ago does not mean eBooks should be eliminated from your content strategy entirely. eBooks still prove highly popular among audiences for a handful of our clients, and as such, we keep creating them. The real purpose of this blog is not to dis eBooks—it’s to remind you content marketing is more than a compilation of text. So open your mind and, yes, “think outside of the box” to engage and delight your audience in new ways. What creative content offers are you using in your marketing? Let me know in the comments!